Command Decorative Hooks come in a variety of styles, from sophisticated to fun and playful, giving you options for every room and every person in your home. Fun spring clips allow you to display photos and paper products like mementos, tickets, coupons and mail. Using the revolutionary Command Adhesive, Command Decorative Hooks hold strongly on a variety of surfaces, including paint, wood, tile and more. No more dangerous, tangled cords behind your computers, appliances and entertainment centers! Command Cord Organizers are perfect for work and home offices, as well as entertainment areas, where they keep cords organized and safely out of the way. 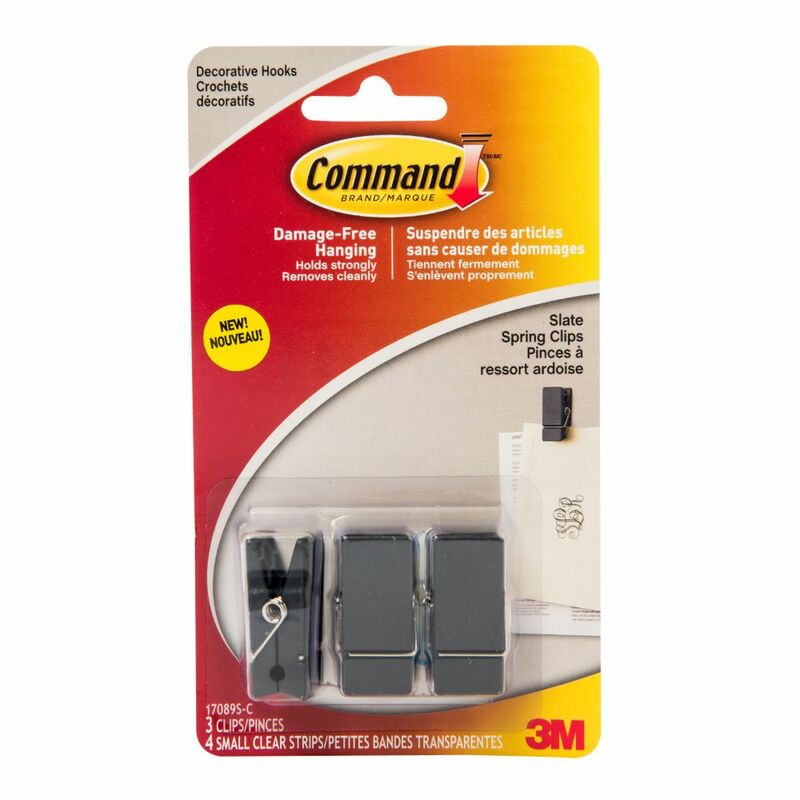 Command Cord Organizers hold strongly on a variety of surfaces, including paint, wood, tile and more. They also come off cleanly no holes, marks, sticky residue or stains and if you need to re-organize your cords, its as easy as applying a Command Refill Strip, so you can use them again and again! Contains 8 clips, 12 strips. Command Terrace Hooks offer damage-free hanging, and can hold strongly to a variety of surfaces, including paint, wood, tile and more. When you are ready to remove your Command Hook, it comes off cleanly without damaging surfaces with holes, marks, sticky residue or stains. Command Terrace Hooks with All Weather Strips are perfect for hanging wreaths, signs, thermometers, artwork, or other decorations on a variety of smooth outdoor surfaces. Command Damage-Free Hanging Hooks hold strongly on a variety of surfaces, including paint, wood, tile and more. When you are ready to remove your Command Hook, it comes off cleanly without damaging surfaces with holes, marks, sticky residue or stains. Small Spring Clip, 17089S-C, slate Command Decorative Hooks come in a variety of styles, from sophisticated to fun and playful, giving you options for every room and every person in your home. Fun spring clips allow you to display photos and paper products like mementos, tickets, coupons and mail. Using the revolutionary Command Adhesive, Command Decorative Hooks hold strongly on a variety of surfaces, including paint, wood, tile and more.